DH wants a new barbeque. what do you recommend? it needs to connect to a low pressure quick disconnect already on the trailer and have it's own legs and/or shelves. but it has to fold up so it can be stored in the basement storage. how do you clean it after use? I don't want to be putting a greasy barbeque into the storage compartment and getting it greasy and dirty? we only have one storage compartment for everything. and of course, the barbeque actually has to work. she wants to do things like ribs, burgers, fish, and vegetables. My buddy uses a Weber Q and he is done it goes into a custom canvas bag before stowing it. It also has a separate folding table from Weber and he Stowe's that separately. I use a Weber Q2000 on a folding table. I clean it at home when needed. I carry extra tin drip pans and switch them often. To convert it for low pressure, look at the Converta-Q kit from Torjik. I just converted mine and it was quick and easy. If you like charcoal the PK Grill is a great one. I went a different direction with the Blackstone Tailgater Grill/Griddle Combo. For just the two of us the smaller grill is no problem, it can hold ~4 steaks (tight fit) or 2 large ones with room to spare. We really like having the griddle in addition to the BBQ. It would need to be converted over for low pressure. I left ours alone and just carry a propane tank because I like it so much that I use it while at home as well. I have a Blackstone griddle and put a rv quick connect lp grill hose from calore equipment on. This is the best Gas Grill around! 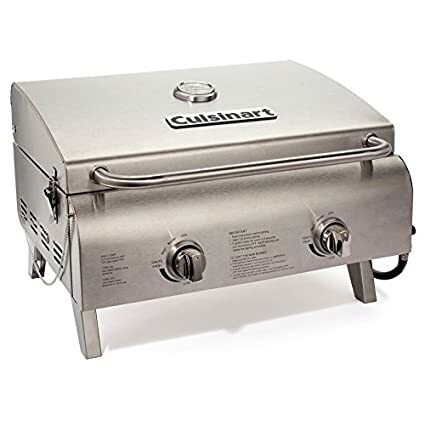 All stainless steel exterior; stainless steel grills; Two burners (so you can bake those steaks after you sear the outside); Temp gauge; fairly compact so it fits in the RV; light weight; Works Great! The folding lets make it smaller for storage, but be careful not get your fingers caught in them (I put an extra screw in the legs to keep them from folding since I don't have a height problem where I store it. Best of all it's about half the price of the RV and marine store prices for similar quality! Another vote for Blackstone. Debated on the 17" or the tailgater mentioned by CraigBean7672. We liked it so much we got the large one for the house to replace our old grill. For cleaning you just rinse it with water while its still hot, and that's it. You mentioned legs, that's where the tailgater has the advantage, but we place ours on a folding aluminum table, its a perfect fit. There are many options that can use the quick connect, but just about every one has to be modified. And the modification is grill specific, as in, there isn't just one way that modifies them all. We have seen the 17" table top at walmart for as low as $74, but not all walmarts have them, it is kind of luck to find it on the shelf. Costco has one just like that and I really like it but the lid is too close to the grill for me . My Balltips would be holding the lid open .